He may have his doubters, and to be fair, they have a point. Kevin-Prince Boateng doesn't have the subtlety of a trequartista, the man who plays behind the strikers. In fact, he often doesn't have any subtlety at all. On paper, his job description may require a refined touch, one that can discern potential gaps anywhere. Boateng, however, tore up that description long ago. And today he tore up Lecce. It became clear that Milan coach Massimiliano Allegri preferred only a nominal playmaker last season; what he really wanted was a player who knew how to move with the front pairing, to carve out spaces and take chances himself whenever possible. It is to Boateng's credit that he has managed to parse the role and the coach's demands so expertly, and to instill his own vision onto a position that requires precisely a visionary. Today he came on when Milan were 3-0 down, and seemingly resigned to their fate of not being able to right the ten-year winless record at Lecce. His introduction in the place of an ineffectual Robinho, and Alberto Aquilani's replacement of an unforgivably terrible Massimo Ambrosini, completely changed the dynamism of Milan in the middle and final third of the field. With the duo, Milan were different--and worryingly so. Worrying, not just for the rest of the Serie A, but also for Allegri and the Milan fans, who will nervously try to reconcile such contrasting halves. Can Milan ever do without any of their starting eleven? At the very least, they can seldom do without Boateng. The 24-year-old was a disgrace in the 2-0 loss to Juventus, but he has made up for that with three strikes today, and with three particular strikes in the last two games. We perhaps had a preview of things to come when Boateng flattened Bate Borisov in the Champions League on Tuesday with a thunderous shot from the edge of the area. After that goal, he remained intensely composed, simmering, not allowing himself unrestrained joy. The muted celebration was seen as sort of a penance for his red card against Juventus, and if that penance was not enough--it did come after Zlatan Ibrahimovic had virtually ensured three points--today's hat-trick, in fourteen minutes, which almost heralded Mario Yepes's winner, was surely redemption. His first two strikes were also from the raging thunder category. Milan will still have a lot of revision to do after this game. The defence was generous, and the midfield was incapable of imagination. 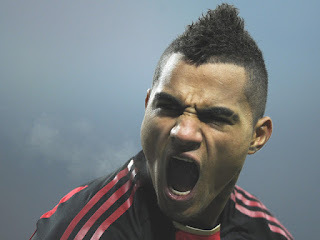 However, Boateng was capable--and that is worth celebrating the way the Ghanaian normally does. Boateng is simply amazing, while it is painful to see our captain reduced to near useless. I personally don't remember Milan ever coming back from a 0-3 and win the game. I have followed Milan for more than 20 years. and I like to point out that we were lucky today that it was only Lecce. If it was Lazio or even Genoa, we would be buried. I hope that Allegri will learn the lesson. Yeah, but I do remember Milan's 3-3 draw with Atalanta in 2003. Milan came back from 3-0 down, and had Rivaldo scored his penalty, Milan would have won. The 4-4 with Udinese also comes to mind. and of course, who could've forgot about the famous 3-2 derby win? That derby win was the best! Tiziano Crudelli was the best also :).